The government has ordered Ang & Associates Lawyer Co. Ltd., a company headed by well-known businessman Kith Meng, to cease logging in an area of Stung Treng province where a hydropower dam will be built. Sesan district governor Yeang Srey Sary said Thursday that a delegation of officials from the Ministry of Agriculture, led by Secretary of State Ty Sokun, held a meeting with provincial authorities to announce that logging is suspended until the boundaries of the proposed dam reservoir have been properly demarcated. “The suspension is effectively implemented from today on­wards,” Ms. Srey Sary said, adding that the decision was due to reports of illegal logging outside the company’s concession. “There are reports from local communities and authorities about the illegal logging but we don’t have any clear reports on how extensive the logging is inside and outside the reservoir area,” she said. Since April, complaints have emerged of logging outside the boundaries of the 36,000-hectare concession for the Lower Sesan 2 dam located in Sesan district. The concession is a joint venture between Mr. Meng’s Royal Group and China’s Hydrolancang Interna­tional Energy Co. Ltd. The clearing of the dam concession area, according to documents dated January 2013, and obtained by The Cambodia Daily, the clearing of trees in the dam reservoir was to be contracted out by Mr. Meng’s Ang & Associates to Sok Vanna—who is the brother of local conglomerate Sokimex Group founder Sok Kong. 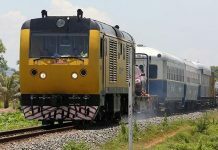 The request was endorsed by Prime Minister Hun Sen on October 12, the document states. 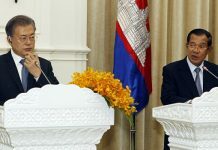 “[The suspension is approved] to take measures to effectively get rid of anarchic deforestation happening in Stung Treng province and to im­plement procedures properly when collecting the forest’s by-products,” states the document, which was signed by Bun Uy, secretary of state at the Council of Ministers. Chan Ang, the personal secretary of Mr. Sok Vanna—who has a contract with Mr. Meng’s Ang & Associates to divide profits of logging in the area—said Mr. Vanna had already stopped logging in the dam concession area. “Sok Vanna has stopped doing it for a long time already,” Mr. Ang said Thursday. “I haven’t seen him involved in it for about one month,” he said, referring further questions to Mr. Meng, who did not respond to a request for comment. 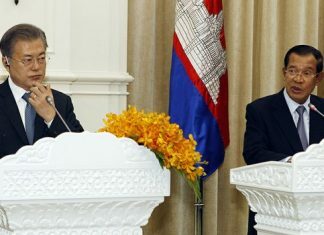 Siek Mekong, chief of Srekor commune, where the dam concession is located, applauded the suspension, and said it was better late than never. “The decision to suspend the logging is a bit late since a lot of big, luxury wood trees are gone and only a few are left, but it’s still not too late for our forest to survive,” Mr. Mekong said. Meach Mean, coordinator for the 3S River Protection Network, a local NGO, said the government should thoroughly investigate what has taken place in Sesan district. “The government should look into it and take action if the company is not following the [right] process. They should take back [the concession],” he said.